This past weekend, the stage was set for the annual Mr. and Mrs. UCF Scholarship pageant. Twenty contestants in total, 6 men and 14 women, took on the task of following in the footsteps of 2018 Mr. UCF Braxton Watson and 2018 Ms. UCF Courtney Jones. On Friday evening, 6 men showcased their hard work and dedication that went into this event. Each of these students put out their best foot forward in every facet of the competition with hopes that they would be crowned Mr. UCF. As the competition came to close, one contestant began to stand out; contestant #6: Malachi Mullings. Mullings, a freshman, whose platform was “Pro-Create: Creative Expression” chose to use his talents to highlight the issues that a young black male faces in America on a daily basis. With confidence, swagger, and poise; it was clear to the judges that Mullings was the embodiment of the UCF Creed and consequently being the best contestant to become the 2019 Mr. UCF. Following the crowning of Mr. UCF, all eyes were set on the Miss UCF pageant. This competition which was included 14 talented women, drew a crowd with the likes of Ms. Apoka and Ms. Pasco County. Among the contestants, one individual’s pageant reputation preceded her, contestant #3: Keyera Lyn. Lyn is a graduate student with numerous accolades; including the current Southern Region Miss Black and Gold. Lyn devastated the competition using her experience and pageant knowledge as a stepping stool to being crowned 2019 Miss UCF. Mullings and Lyn made history this past weekend becoming the first African American pair to be crowned Mr. and Mrs. UCF together. Mullings made other marks on the record books by becoming the first African American freshman to be crowned. 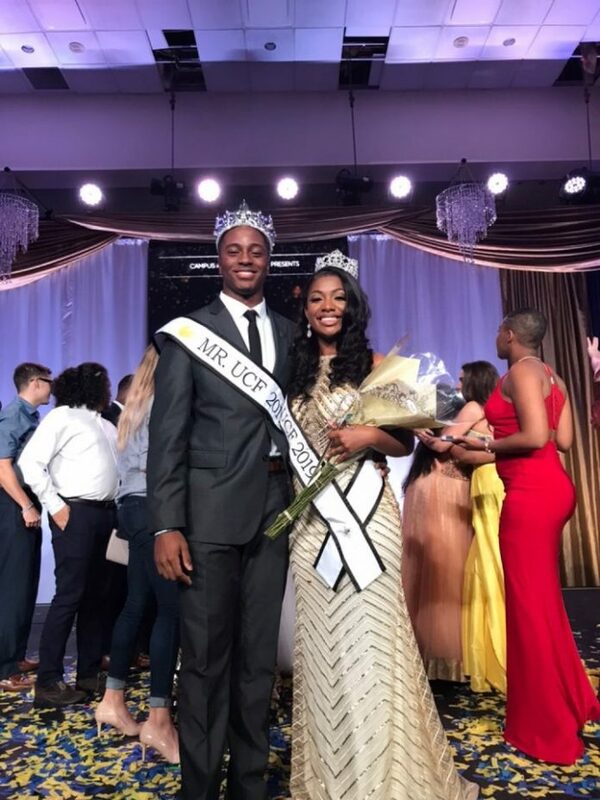 Following the crowning of Mr. and Mrs. UCF, the Homecoming King Darrius McFadden and Queen Alexus Williamson are joined by two more African American students as the ambassadors and representatives of the institutions. Each of these individuals are leaders within the community and their on campus organizations respectively. These four game changing students are tasked with creating a newer environment for students of all ethnicities and backgrounds to be welcomed.